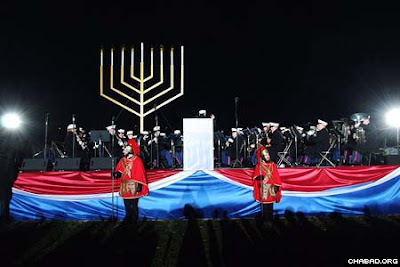 The photos above are of the 2007 ceremony of the lighting of the Chabad so-called "National Menorah" on the White House lawn in Washington, D.C. The photos show Khazar Chabad rabbis dressed as Greek soldiers--ancient enemies of the Maccabean Jews. 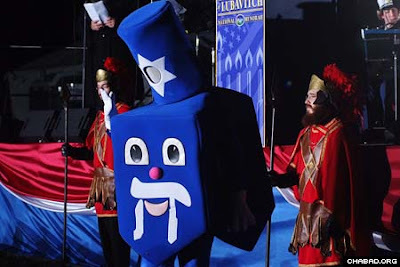 Some may be aware of the Judaic tradition of reversal (hippuch) where, for instance, men dress as women and women dress as men during Purim celebration. There is a Kabbalistic gnosis veiled beneath this Judaic reversal symbolism that runs deeper than mere festivity; "redemption through reversal (hippuch)". ADL Board Member's Grandson Transformed as "al Qaeda" Agent Threatens "Islamofascist" Attack on U.S.
Everything's Kosher in Washington D.C.